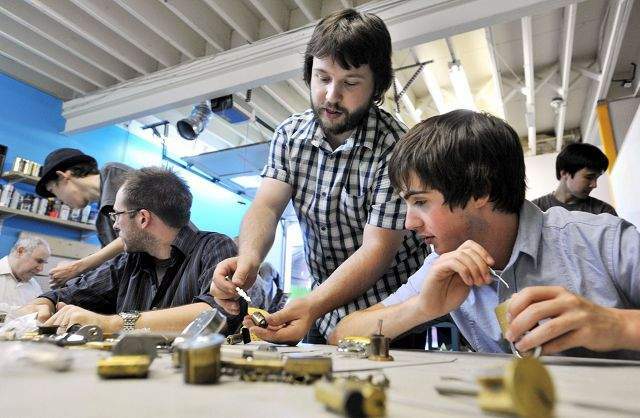 Competitive lockpicker Schuyler Towne, center, teaches Alex Kalamaroff, right, about a type of lock July 2 during a competitive lockpicking class in Somerville, Mass. Locks and lockpicking items rest on a table. SOMERVILLE, Mass.  Schuyler Towne took a gleaming brass lock, inserted a small bent piece of flat steel into the keyhole and gently applied finger pressure. Then he slid in a lockpick and manipulated the mechanism until it swung open. Towne, 26, is not a burglar. Hes a lockpicking instructor and part of a growing competitive movement called lock-sport that involves learning the theory of locks, analyzing the devices and figuring out ways to defeat the systems quickly without destroying them. While lockpickers thrive on the intellectual thrill of beating all sorts of locks, they oppose attempts to use the skill for mischievous purposes and have laid down universal ethical guidelines. You never pick a lock you dont own, and you never pick a lock thats in regular use, Towne said. Some lockpickers observe a code of responsible disclosure by providing manufacturers information on weaknesses they discover in locks they defeat  just like responsible computer hackers do when they detect security flaws in software. Still, the sport worries some law-enforcement authorities, like James Pasco of the National Fraternal Order of Police. Im sure that they are having a good time, and Im sure that the vast majority of people engaged in it are just puzzle-solvers of a sort, (but) you run the absolute risk of educating criminals who might be inclined to pick locks for illegal purposes, you know, Pasco said. Babak Javadi of the U.S. chapter of The Open Organization Of Lockpickers, or TOOOL, disagrees. He says locksport requires enthusiasts to invest a lot of time and patience to learn the skills. Whats more, crooks are likely to use crowbars and saws to pick locks quickly because they do not care about surreptitious entry, he said. The practice of lockpicking generally is legal if the picker owns the lock or has explicit permission from the owner to pick it. But possession, creation and distribution of lockpicking tools may be illegal, depending on the location. Locksport fans compete in several formats, including head-to-head contests that determine the fastest lock picker. In the so-called Locksport Wizard, each contestant is given a burlap sack containing an identical set of locks and is required to pick them blindly using only tools they have put in the sack. Townes group meets once a month in a Somerville garage converted into a studio for artists. Winners at its contests take only one prize  pride in being the best lockpicker. John Loughlin of Stanton Concepts LLC, a Stanton, N.J.-based company that designs and licenses high-end security lock technology, said feedback from locksport enthusiasts pushes some manufacturers to develop more secure locks. Loughlin has been working with the Netherlands-chapter of TOOOL, which is based in Amsterdam, to develop better locks. He sends members prototypes of his high-security locks, and asks them report any discoveries of potential weaknesses. Locks are a product of a centuries-old search for robust ways to protect privacy, valuables and personal security. The oldest known lock, from Egypt, was made of wood and was dated to be about 4,000 years old. It relied on the same pin tumbler principle that is used by many of todays most popular locks. Towne, who is a graphic arts designer by profession, first was introduced to lockpicking at the 2006 Hackers on Planet Earth conference in New York. He says locksport is popular in Europe, especially in Holland, which hosts the big LockCon contest. In the United States, the hobby slowly is becoming much more than an underground pursuit, with enthusiasts meeting and competing at hackers events including the DefCon security conference, Towne said. There are no records on the number of locksport enthusiasts in America, but clubs are popping up at universities, colleges and local neighborhoods, he said. 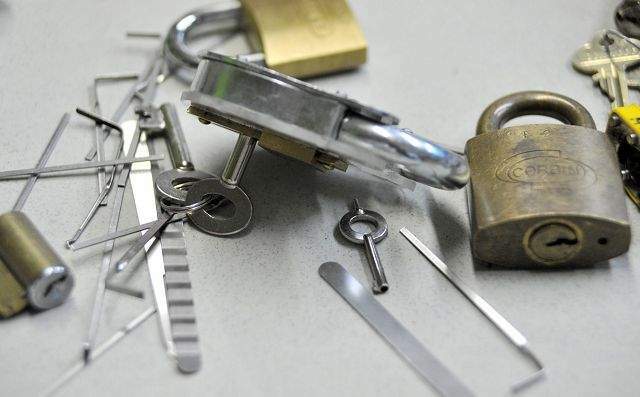 Loughlin said 60,000 members belong to the online club Lockpicking 101, and another, Locksport International, had 14 chapters in the United States and Canada in 2009. The idea that its OK to learn to pick locks takes a little bit getting used to than anything else, said Jeffrey Drucker, of Allston, Mass., a member of the Somerville club and a lockpicker since December. Drucker, 63, is legally blind, which adds to the challenge. So, I just tell them, Even if I pick the lock, Im not likely to find the valuables inside the house anyway, so what difference does it make? he said.